62 minutes of pure spiritual passion. Teron Carter (BONE) and Stacy Jones (COFFEE) have meshed their talents for the last 6 years and their perfect chemistry is clearly evident. 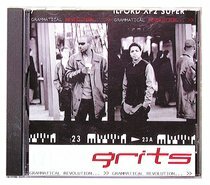 GRITS have been described as having one of the best live shows seen. But it's the music and lyrics on this record that will redefine their already high standards. The songs on the album discuss topics ranging from the dues they've had to pay over the years to how success should be measured in faith and relationships, not by dollars and fame. We have a need to reach the kids that only understand what the world has to offer. GRITS will help bridge that gap that separates our future from the truth.